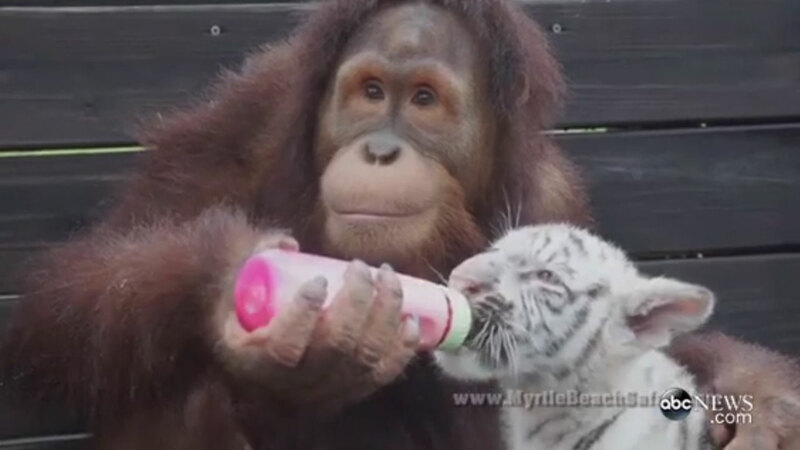 Suriya the orangutan bottle-feeds tiger cubs at the Myrtle Beach Safari preserve. MYRTLE BEACH, S.C. (WLS) -- An orangutan is taking it upon himself to take care of four young tiger cubs at a South Carolina safari park. Suriya the orangutan became curious in the cubs when human handlers began caring for them, and has since taken them under his wing. "Suryia showed genuine interest in the cubs when the humans were feeding and caring for them," Robert Johnson, a senior trainer at Myrtle Beach Safare preserve told ABC News. "As the saying goes, 'monkey see, monkey do.'" Suriya was born at the preserve, and is one of four orangutans who live there, among 10 other apes. All of the tiger cubs are between 1 and 2 months old, and apparently enjoy being bottle-fed by Suriya, as well and cuddling with him. "Suryia started mimicking the human care giving behaviors and became very connected to the mothering process, which is particularly interesting for a male orangutan," Johnson said.